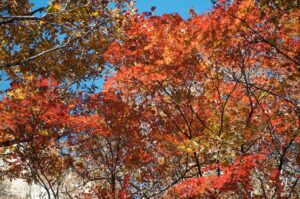 We were living abroad in Seoul, South Korea when we went on this adventure in middle October. 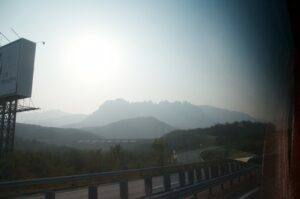 Our trip began just before midnight in Seoul where we boarded a bus with dozens of other excited hikers. Our trip was arranged for non-native folks and consisted of mostly foreign teachers living and working in the city. 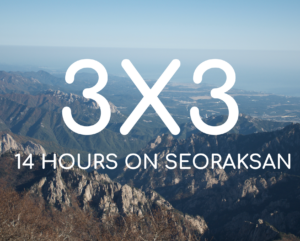 4 hours later, we arrived at our destination, Seoraksan The third tallest mountain located north-east of Seoul and just west of Sokcho and the East Sea. We started our hike just after 2 am and unsurprisingly there were already dozens of other buses dropping off hundreds of other Korean hikers, well prepared with the latest hiking boots, poles, packs, and lights. Rolling up in shorts, hoodies, and a bunch of granola bars stuffed in our bags, we felt a little ill-equipped but we pushed on. What followed was a steady climb to the peak and a descent of about 12 hours through a twisting canyon filled with beautiful fall colors. 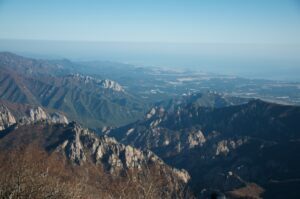 There was a hostile too and another whole story there but the part that remains with me was how kind and generous the Korean people were along this hike. Numerous times we were offered freshly cut fruits and veggies, Makgeolli and soju and Jeju chocolates. While trying to find some provisions near a mountaintop shop, I was invited to join a group of Korean hikers at their table to enjoy some homemade kimbap. My Korean is very poor but one of the hikers did speak some English and asked about our hike. After a while of struggling through conversation about how beautiful this all was, we all got back on the trail. Moments like these, and these are not the only moments of incredible kindness we experienced while living abroad that we come back to in my everyday. Trips and places will always be memorable but the people and those interactions are what made the trip. We knew it would be a long hike but none of our crew realized it would be 14 hours. Still worth it! Still recommend! Dr. You granola bars, Kimbap, Makgeolli, Soju, kimbap triangles, Some real tasty bbq at the hostile! We really lucked out with very good weather. Another teacher had completed the hike the week before and reached the top in a snow storm so def check the weather prior and B E P R E P A R E D.